This summer, the Parade travelling theatre festival will be making its 22st tour through the Netherlands. This fun cultural event always brings a rich array of artistic surprises in tow. The festival kicks off in Rotterdam and stops in The Hague and Utrecht before making its way to our fair city. August 5 is the big day for Amsterdam, when this theatrical circus rolls into the city’s Martin Luther King Park. The majority of the theatre performances are in Dutch, but even for non-Dutch speaking visitors, the Parade is an experience that’s not to be missed. There’s a slew of live music performances, plus all the exciting activities, culinary delights and the truly unique atmosphere guarantee a memorable day out no matter what language you speak. In short, at the Parade there really is something for everyone. Whether you’re a die-hard theatre devotee or just along for the ride, you’ll find it here no matter what your pleasure is. Once on the festival terrain, you’ll find yourself enticed by artists giving outdoor performances in full regalia. The festival offers visitors a variety of short and full-length performances, as well as performances in open-air and secret locations. There’s always something new and surprising to look out for! The afternoons have plenty in store for kids, too. The KinderParade features crafts, kids’ theatre and cooking. Kids just love the old-fashioned funfair swings ride, where you can even find a few of the older festival goers having a whirl as the evening wears on. Hungry visitors can also choose from a variety of restaurants and food stalls. There’s everything from sushi to burritos, and ice cream to poffertjes, the Dutch mini pancakes, with wine and cocktails to sip on. And don’t forget the big, old-fashioned candy shop. For the hearing impaired, the festival provides Dutch sign language interpreters at several performances. The festival is on in Amsterdam until Tuesday 21 August. Accessibility: Visitors are advised to take public transport or travel by bike. 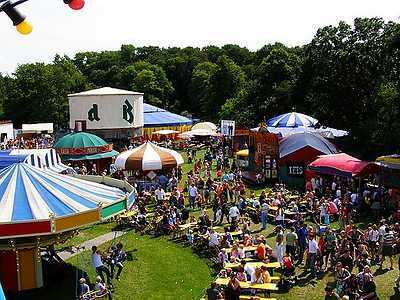 The festival grounds are accessible on foot or by taking tram 4 or 25 from Amstel Station. Click on the link below to get your tickets!